If there is one type of attribute I despise in a person it is a lack of humility. But it is inevitable in life that we will encounter braggers on a regular basis. The best approach for these people – absolutely nothing. With a bragger the temptation is to mock them or knock them down a peg or two. The problem with this is that it makes YOU look like the insecure one! I have known a few braggers in my time and the people who make fun of them run the risk of making themselves look petty and jealous. If you are in a group situation and you have listened to someone who lacks humility, it is likely everyone else in the group has. The bragger may leave at some point and then the group descends into bitching. The temptation is to get in the group mentality and start joining in – whatever you do don’t! It won’t make you feel any better and there is a possibility that someone could be two-faced and report back what you said. Just listen and observe and be glad that it wasn’t just you that noticed a big-headed bragger! Another method is trying to upstage the bragger. This is pointless because the reason for bragging is down to their own insecurities and because of this they will always find a way to belittle your own achievements. In childhood my best friend Simon was needlessly insecure because his parents had divorced and I was in a happy family unit. How did he make up for this? He would brag, talking about where his dad had taken him, what his step dad had bought him, all the foreign holidays they went on. To make it worse he would brag because his family had the wealth to spoil him. But I was never going to one-up Simon – even if it was really impressive he would find ways of putting down everything I ever did. After a while I had no energy to even try to compete. I soon realised that Simon was actually a bit of a prick and we grew apart. 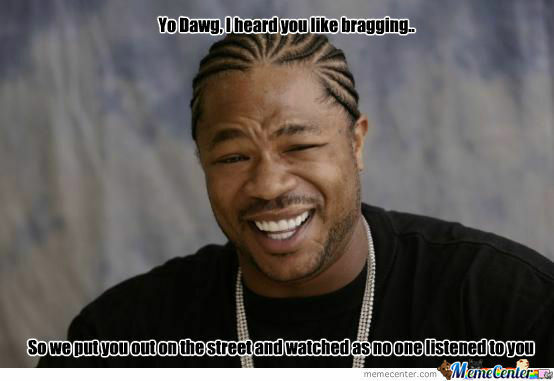 The worst way to handle a bragger is to dwell and actually be jealous of what they say. I have already mentioned in a past post, I encountered a bragger who couldn’t help brag about how well his project was going. Mine was going okay, but nowhere on the level of his success. So I let myself stew over this, his success was my failure. I don’t mind people being more successful than me, but what really annoyed me was his lack of humility. “Why does it matter? Concentrate on your own results”. And that is the best advice I have ever received and those words I follow to this day. So focus on being better and not bitter. I found that once I stopped dwelling on a bragger and put that focus into my life, things for me got much better. The good thing is because you’re not insecure, you won’t become another bragger. Instead let your actions do the talking. These are statements that don’t really open up the opportunity to continue showing off. But make sure this is said with sincerity otherwise it will come across as sarcastic and you go back to coming across jealous and insecure. When I learned that the bragger was insignificant my life got better – I didn’t feel I had to live up to others, be threatened by their ‘achievements’* and learnt to enjoy what I had done. *Note I say ‘achievements’ because as stated a bragger is insecure – although they may have actually achieved what they are bragging about there is the possibility that they have made up the achievement to feel better about themselves. If that is the case the joke is on them as they will feel more insecure in the long run for lying about things they haven’t actually done. doing nothing – oooo i like this strategy. i am good at it! Whenever ppl complain to me about how others get better treatment and why is it that some ppl get to skive off at work and they themselves can’t and would even get into trouble for it? I’d always respond to them this way as well. “Why do you care? As long as you do your part and ensure things don’t go wrong and you actually learn something through your experience? You’ve got nothing to lose and all to gain. And to heck with others who are making you feeling horrible. They aren’t worth your time” lol. I mean ppl can’t fault you for doing your job right. A lot of ppl are so focused on others not doing their jobs that they’d start doing the same. Not good. No point copying the bad role models – in many ways it is an advantage, because those who work hard, are good and prove themselves valuable move up. The lazy languish! And thanks! Always good to hear others thoughts!